Guard Frequency Origins: Continues with more interrogation and intimidation! Did you drive in the Daymar Rally? Otherwise, we’re out of ideas, what do you want us to talk about? i will take the fact that the dice rolls are streaky, but in the last show, our main heroine made some awesome rolls. Speaking of that, do these characters have names or should we just use the players names for them? Personally i find the inability to even have heard of paper somewhat bizarre. I can’t read cuneiform, but i know what it is, even if i have never seen it in person. Especially if you add in the trope of the lost colony with old tech still being used. Regarding the Fandom License requirements from Cloud Imperium. Cloud Imperium is asking for two things to be done: Make it clear to consumers that your product is not an official one, and don’t use their stuff for commercial purposes without making arrangements with them first. I find this is in no way a bad or discouraging thing. I’m happy to have some published guidelines on how I CAN use their IP in my own creative work. I’m glad to know that they are encouraging such efforts and can protect their IP at the same time. I’ve tried to see these requirements as the oppressive act of a corporation that doesn’t understand the value of nurturing fanon to go alongside the canon that they create. I can’t come to that conclusion though. 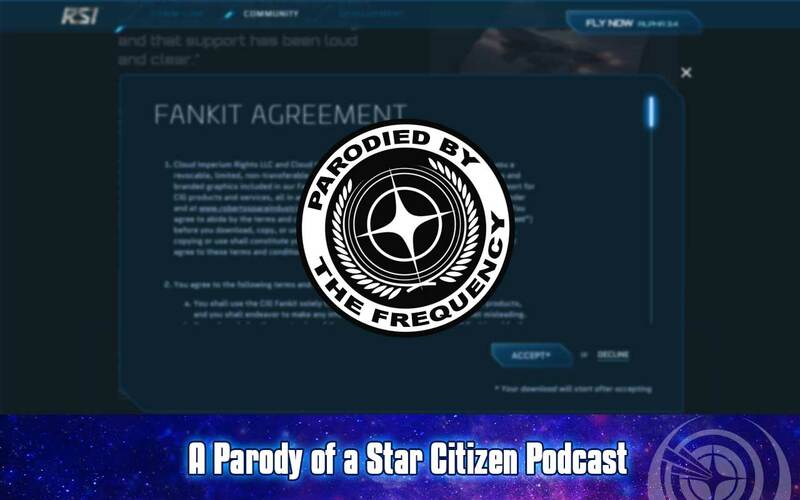 As people that want Star Citizen to be a successful entertainment property for years to come, we should want clear distinctions between what is official and what is not. I know that I do. The disclaimer that they want added to publications? 9.7 seconds is how long it took me to read it out loud. Geoff seems to want to do this Star Citizen news segment. 9,7 seconds isn’t too much of your air time to allow for Geoff? How many of the format changes to GF were driven primarily by Tony’s wants? GF’s a team, right? It doesn’t make sense, nor is it reasonable to expect of any person, that the person continue to voluntarily create or aid in the continued creation of content supporting a project that has already surpassed the maximum number of objectionable acts committed that is tolerable by the person. Hmmm, I didn’t realize how pro-CI biased Brian is until this episode. I really appreciate your enthusiasm, but balance Brian, balance. For the scooch lower expectation in the beginning, you guys actually provided good radio. Nice save! Would you download a free version of Star Citizen from WeBeFreeStuffcom? I hope not. You would go to the official website. Fandom content question as to official OR non-official -> Anything on RSICOM is official, anything else from anywhere else is not. Here’s a couple discussion items: 1. Should SC concept ship sales ever end? 2. Should SC/S424 schedule season pass or DLC content on the 2022 (post release?) roadmap? 3. Is there even a road map after release? BRB – go make good radio.